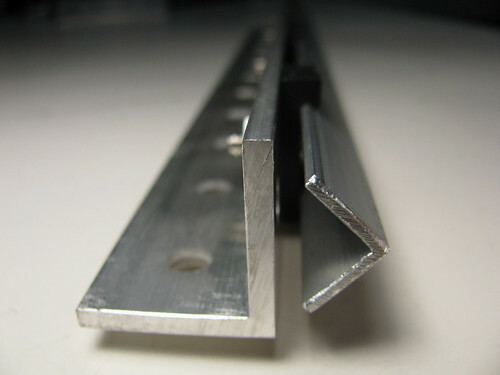 Linear rail consists of a thin aluminum angle held by several rail supports mounted on perforated angle of the same length. 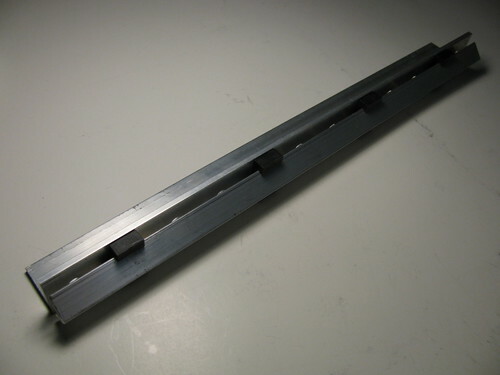 Linear rail comes in several lengths: 6", 12", 18", 24" etc. 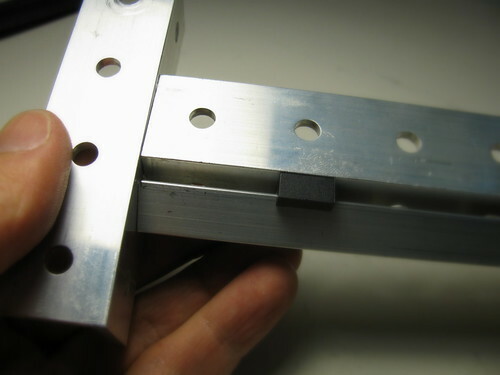 A pair of rails and at least a pair of linear bearings are needed to make a complete linear stage. Saw the necessary length of the thin aluminum angle. 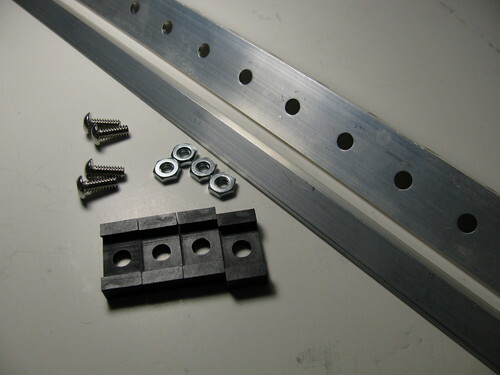 Pre-fabricated rail supports will be available for purchase separately from a kit. 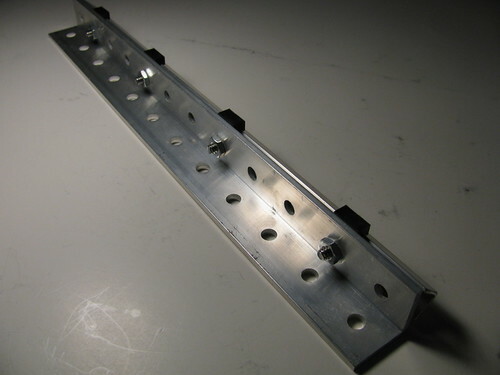 DIY rail supports are made from standard aluminum bar 1"x1/8". Make them from SVG templates, according to the instructions in Howto section. 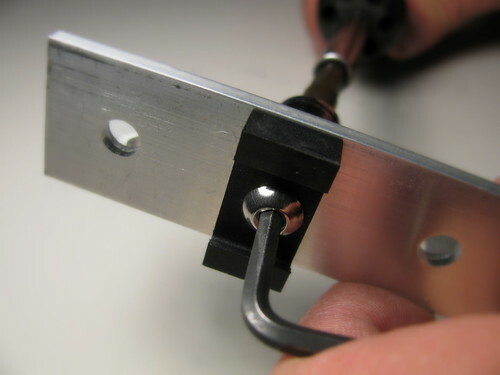 To mark the holes in the bar for 6-32 screws, clamp the bar with an angle piece in a vise as shown (pic__) and use 3/16" dia transfer punch touching the inner wall of the angle when punching. This will ensure that the holes are accurate. Todo: add pictures. Gather parts. 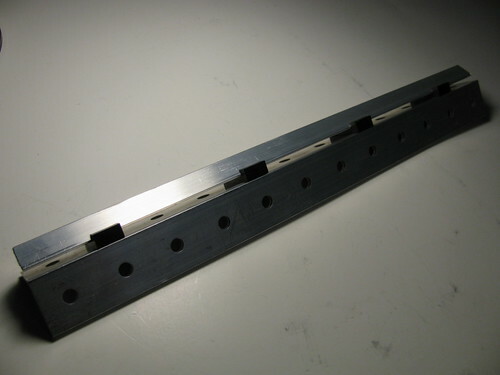 You will need one rail support piece for each 3" of rail length. 12" rail is shown here. The rail supports will be attached as shown, each in the middle of 3" rail length. Attach rail supports with screws, nuts and finger tighten. 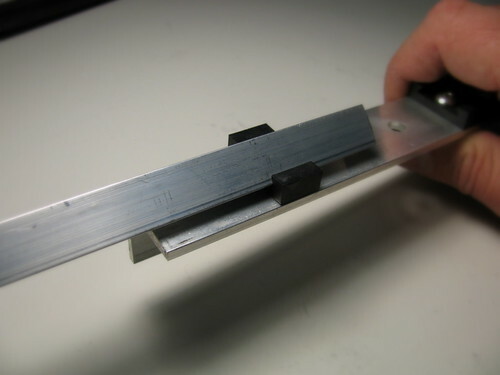 Align each rail support with the edge of the angle using another shorter angle and pressing the rail support against it. 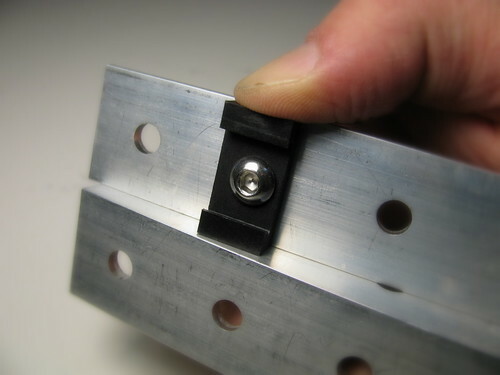 Washers can also be used under the screw, but they need to be centered carefully to avoid grinding on the inner surface of the rail. Carefully tighten the nut (not the screw) with hex socket or wrench, ensuring that the rail support does not move. Insert the linear rail into rail supports - the fit should get progressively tighter as the rail passes through more supports. 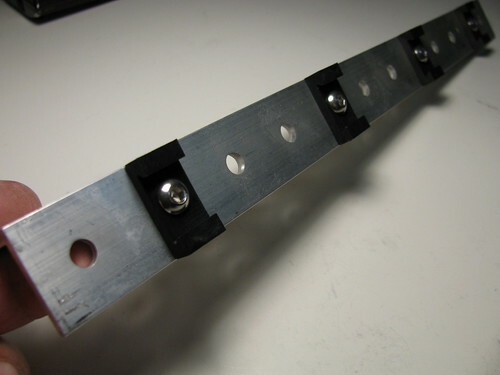 Ensure the rail does not go beyond the angle lengthwise.